The Florida Bill of Sale Forms are legal documents that prove legal sale and purchase or trade between an entity and individual or two individuals. These documents will also prove transfer of ownership of a vehicle, boat/vessel, firearm or any type of personal items. Some forms in the state of Florida will require notarization. General Bill of Sale – This form is generally used for the sale, purchase or trade of personal items. Firearm Bill of Sale – This document is used in the sale, purchase or trade of a firearm in the state of Florida. 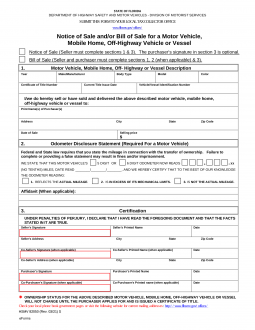 Vehicle/Vessel Bill of Sale – For use when selling, purchase or trade of a boat/vessel, to prove the sale or trade and transference of ownership.